This week's challenge at the Sweet 'n Sassy Digi Challenge Blog is to make a card using the colors green, yellow and orange. Since these are not the colors I typically use, it was certainly a challenge for me. I used this cute Cocoa's Beach Ball digi stamp. I colored him with Prismacolor pencils and then cut him out with my Nestabilities. My sentiment is computer generated. I used this week's Sweet Stop Sketch #118. While it's hard to see in the picture, I added some stickles to the orange paper and to the yellow paper around the sentiment. 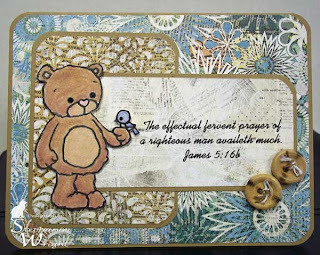 For this week's Say It With Scripture Challenge #7 at The Sweet 'n Sassy Connection, our focus verse is James 5:16b, "The effectual fervent prayer of a righteous man availeth much." Click the Say It With Scripture link to be taken to the post where you can grab for free digi of this verse. I decided to look at the dictionary definition of some of the words in James 5:16b. My husband received an 1828 Noah Webster Dictionary for his recent birthday so I'm using that dictionary as my source today. My first thought when thinking of this verse was to point out that when we pray ardently and earnestly, our prayers have the strength to accomplish quite a bit. That's true - prayer does change things. However, as I read and re-read, the definition of righteous, I am humbled and convicted. How often am I truly holy in heart? How often am I completely observant to God's commands in my daily life? For my prayers to have their full power, I need to make sure I'm holy in heart and observant to God's commands in my life. I don't know about you, but I have some work to do before my prayers are at "full-strength." 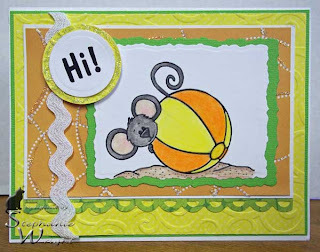 As you can see a little better in the next picture, I popped Rhubarb up on pop-dots before attaching him to the card. I'm not sure you can tell, but I used black stickles for the eyes on Rhubarb and his birdie friend. 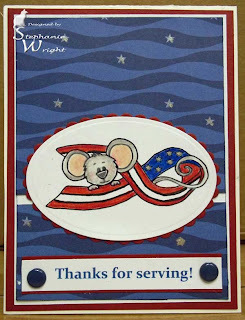 I used this week's sketch CPS#228 for this card. I hope you'll join in this week's Say It With Scripture challenge. Don't forget, there's a free digi each week! Our daughter asked me to make her a card to give my husband for his birthday this week. 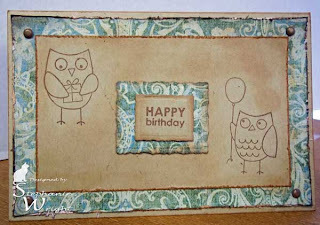 She looked thru my stamps and picked two different owl stamps and a small "Happy Birthday" stamp. 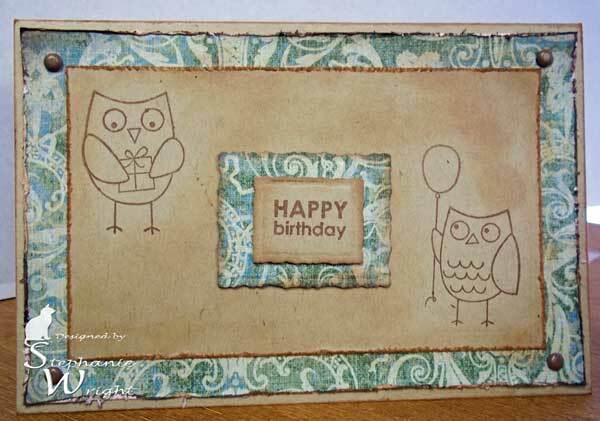 She said she wanted an antique look, distressed edges, the owls stamped in brown ink on opposing corners on kraft cardstock and the sentiment popped up. She then went to bed. :) I accepted her challenge *smile* and here's what I came up with. 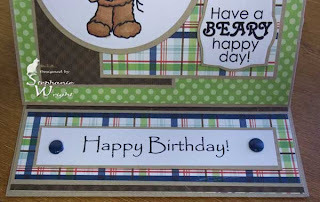 I'm entering this in the Birthday Sundaes: #18 - Anything Goes Challenge. 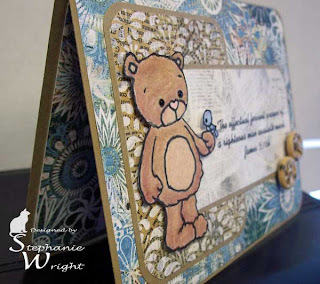 This week's challenge over at the Sweet 'n Sassy Digi Challenge Blog is to make a sympathy card. 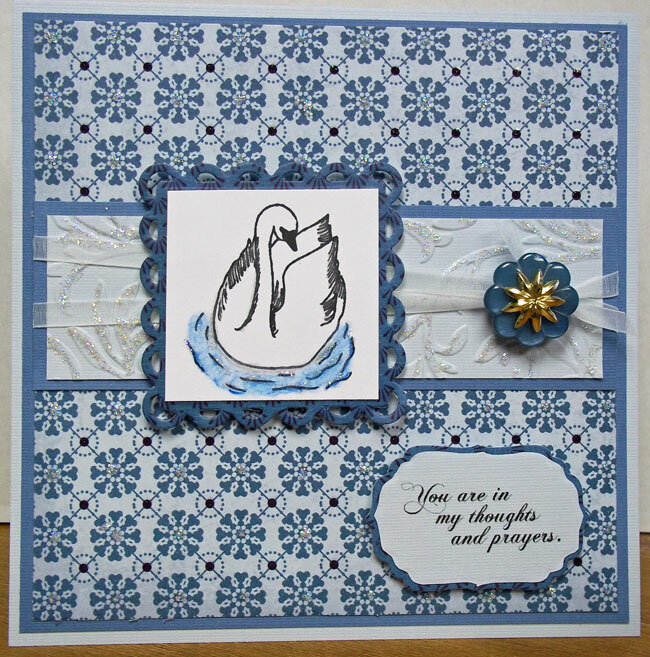 I used one of the swans in the Peaceful Swans Digital Stamp set at Sweet 'n Sassy Stamps. 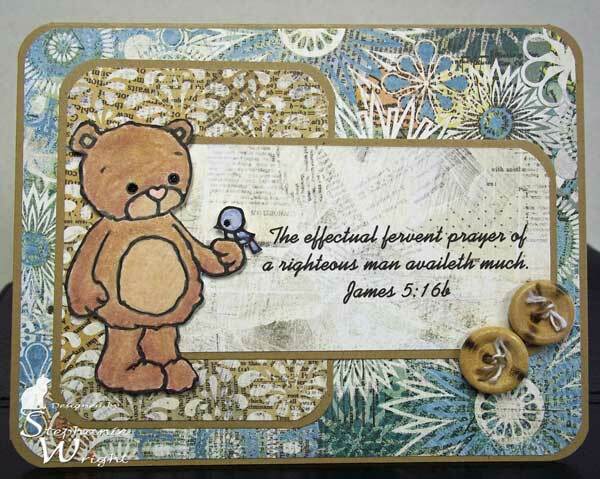 The sentiment is from Praying for You Digital Stamp set. I used a sketch from Christian Paper Crafts (CPCST111). 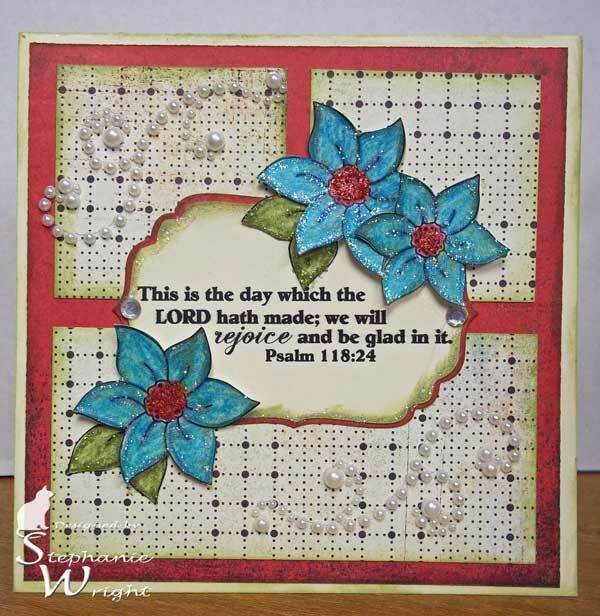 The embossed panel under the image is highlighted with star dust stickles. 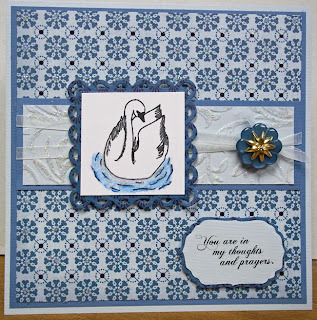 I used the same stickles to accent the centers of the large blue circles/flowers in the background paper and the water under the swan. The blues of the water and the paper match much beterr in real life. 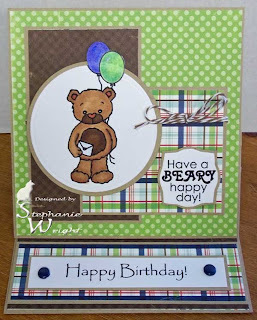 Come play along with us this week at the Sweet 'n Sassy Digi Challenge Blog. 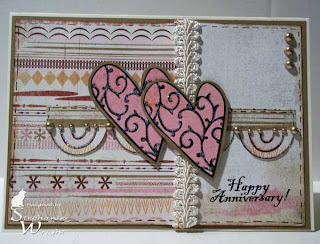 Today I have a birthday card to show you using the Rhubarb digi that was just released today from Sweet 'n Sassy Stamps. He's called Rhubarb's Balloons. Isn't he adorable? I chose to put him on this easel birthday card. 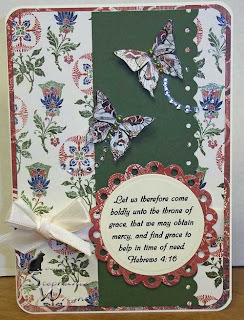 This card is for the Say It With Scripture Challenge #6 at the Sweet 'n Sassy Connection. So many times in life we act boldly when we should be meek and quiet and we ruin things. There are definitely times that it is appropriate to be bold. This verse tells us about one of those times. We are to approach the Throne of Grace with boldness. Is this a demanding type of boldness that says, "You WILL give me my way!"? No, it's a boldness that shows our right to approach God the Father to ask for His help and mercy. Just as children have a right to go to their earthly Father for help and protection, so too we have the right to go to our Heavenly Father for His help. 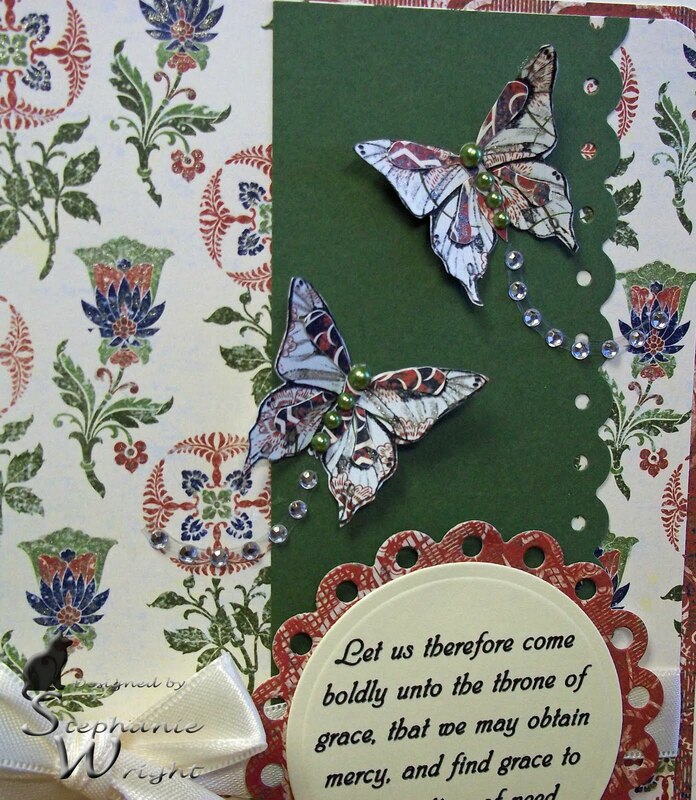 Instructing us to approach the Throne of Grace boldly, means that we're not "bothering" Him. Just like loving earthly fathers, He loves to help us. That is a thought that just boggles my mind. As the song says, "Why should He love me so?" You can't really tell but I used a Sakura glitter pen on the floral design in the background paper. It gives a nice, subtle shimmer to the paper. I used MOJO200 for the sketch. The butterflies are paper pieced and only attached in the center so that the wings can be lifted for some dimension. I'm entering this in the Craft Your Passion #67 - Text It Challenge. I had a request to make some cards in the "criss cross" style. 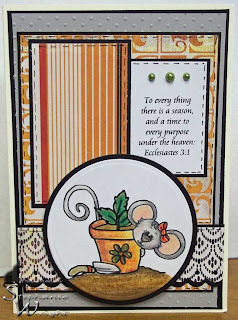 It's an easy card to make and I think works well for those times you need to make several cards at one time. It's also a style that works well for when you want a card that has plenty of room to write a message. Here is a great tutorial from SCS for the Criss Cross Card. Stickles -- I was asked to make sure the cards had some "sparkle." 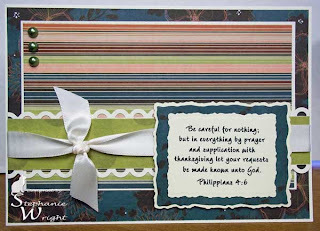 Last Monday's Tips & Tricks with Taylor (TTT08) at the Sweet 'n Sassy Connection was a challenge to choose a simple design to make cards in bulk. I would encourage you to give this design a try. It looks harder than it is and, because of the angle you cut your patterned paper, works well when making in sets of 2's. I'm entering these cards in the Simon Says Stamp...Anything Goes challenge. 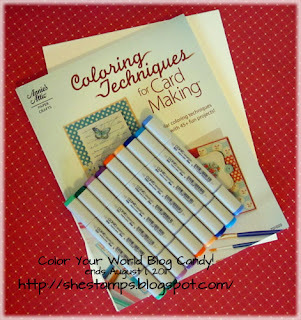 Cheryl, of the She Stamps blog, is giving away some wonderful blog candy. She has not one but two prizes packages that she will be sending to two fortunate folks. 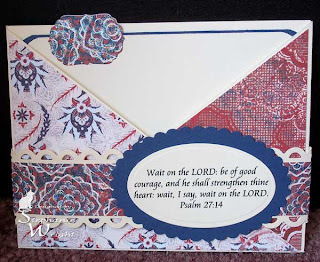 Be sure to visit her She Stamps blog for all the details on how you could be one of the winners. This week's challenge at The Sweet 'n Sassy Digi Challenge Blog is to add bling to your card. I paired the 6 Petal Flower Digi Stamp set with one of the verses in the Rejoice in the Lord Digital Stamp set. I chose Psalm 118:24 because it is one of my Dad's favorite verses. My dad was a pastor and I remember hearing him quote this on Sunday mornings as he was getting ready to go to church. He would always emphasize the word "will." I colored the flowers and leaves with my Prismacolor pencils. Then I went over them with Deep Green chalk ink. I only attached the flowers in the center and curled up the edges a bit. I'm not sure how well you can tell but the leaves and the centers of the flowers have distress stickles and the edges of the flowers and around the Scripture panel have star dust stickles around them. 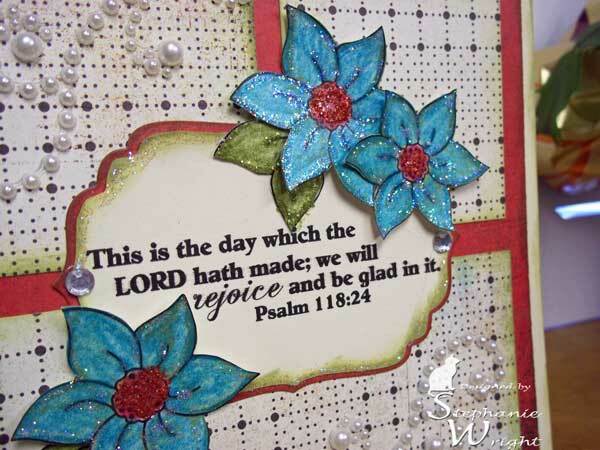 I added some rhinestones to the Scripture panel and some pearl flourishes to add a little more sparkle. I hope you'll join us this week at The SNS Digi Challenge Blog. This is my second post today. 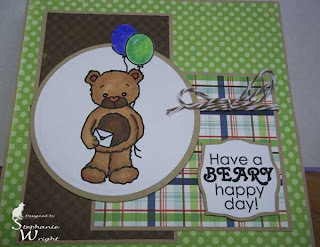 To see the post on how to win a free Sweet 'n Sassy digi, please see my post below or click here. I made an anniversary card this week. I had to take the pics at night so please forgive the lighting. I used this week's sketch at Mojo Monday (MOJO198). I used stickles on the hearts and swags for some sparkle. The hearts are attached with foam squares to pop it up off the card. As usual, the stickles don't show up well in the photo. I went around the edged of the hearts with black ink before I matted them with the kraft cardstock. Yesterday, Sweet 'n Sassy Stamps released an adorable new character. Rhubarb is a cute little teddy bear that will be giving Cocoa a run for his money (in my opinion anyway). In honor of Rhubarb's release, Sweet 'n Sassy Stamps is running a contest on Facebook and today and tomorrow you can get a free Rhubarb digi. You have until July 15th to submit your card. You can check out all the details here: Sweet 'n Sassy Facebook Contest. 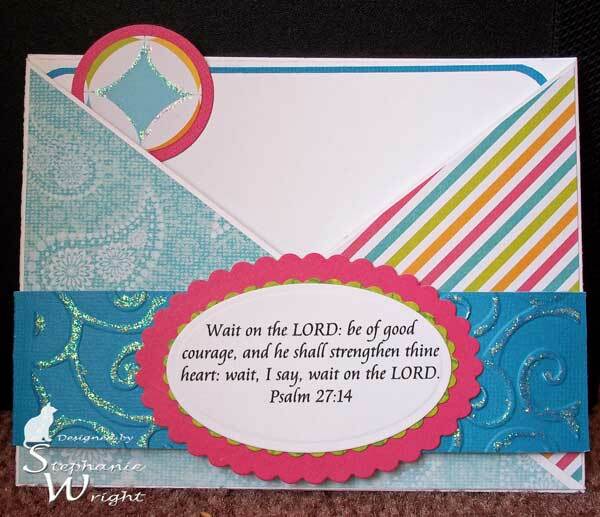 This week's challenge at the Sweet n Sassy Digi Challenge Blog is to use one of the Sweet 'n Sassy Digi Scriptures on your project. 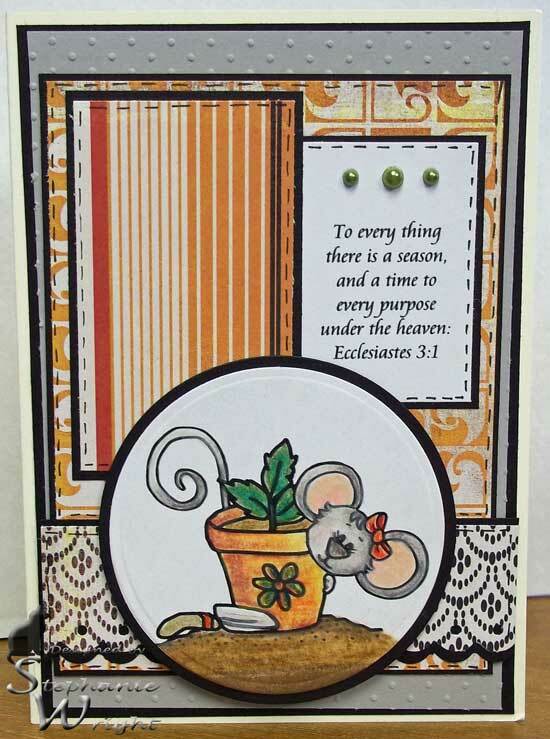 I chose to use Ecclesiastes 3:1 from the Encouragement Scripture Digital Stamp set. I also used the Gardening Cookie digital image. Thanks for stopping by! Come play along with us this week. 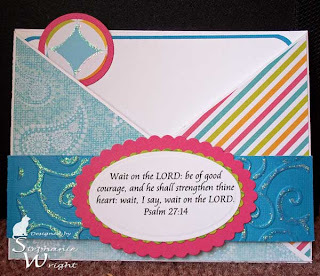 It's my turn to host the Say It With Scripture Challenge (#4) over at the Sweet 'n Sassy Connection. This month we're looking at various verses on prayer. 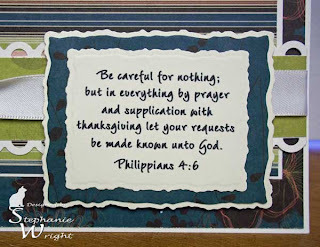 Our focus verse this week is Philippians 4:6 "Be careful for nothing; but in every thing by prayer and supplication with thanksgiving let your requests be made known unto God." This verse is a reminder to me that I'm not to worry about anything. Instead, I'm to take my concerns, circumstances and difficulties to the Lord and ask for His help. 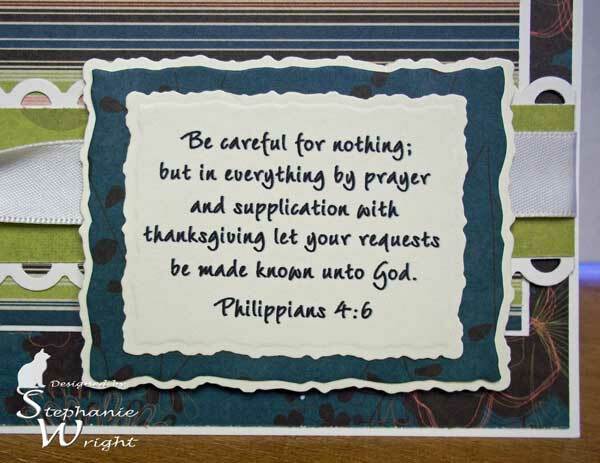 Life can bring us some pretty difficult things so where does the thanksgiving come in? For starters, we can be thankful that we have a Heavenly Father who has all things under His control. Nothing takes Him by surprise and He already knows how things will turn out. While we don't know the end from the beginning, He does! We can also be thankful that our Heavenly Father wants us to bring our cares and concerns to Him. He never tires of having us talk to Him and He is available to listen to us anytime - day or night. A third thing we can be thankful for is that our God actually has the power to do something about our situation. For those trials that, in His infinite wisdom, He chooses not to remove from our lives, He will give us the grace to endure and will stay right there with us the entire time. So this week, as you think on this verse, come to the Lord with your concerns with a thankful heart. Be thankful that we serve a mighty God. We don't need to worry...He has everything under control. For my card I used this week's Sweet Stop Sketch #115. While I sometimes have another image with my Scripture verse, this time I chose to have the verse be the complete focal image. I hope you'll play along with us this week at The Sweet 'n Sassy Connection. 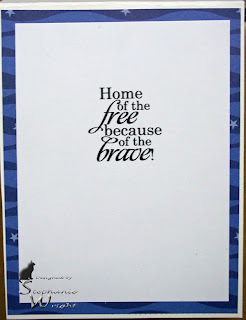 This week's challenge at the Sweet 'n Sassy Digi Challenge Blog is to make a Patriotic card. I chose to use the Cocoa Supports the Cause stamp and color it like a small flag. I used a ruler & black marker to draw the dividing lines and then colored it with my prismacolor pencils. The sentiment is computer generated. I gave the starts in the background paper and on Cocoa's ribbon a little sparkle with a glitter pen. 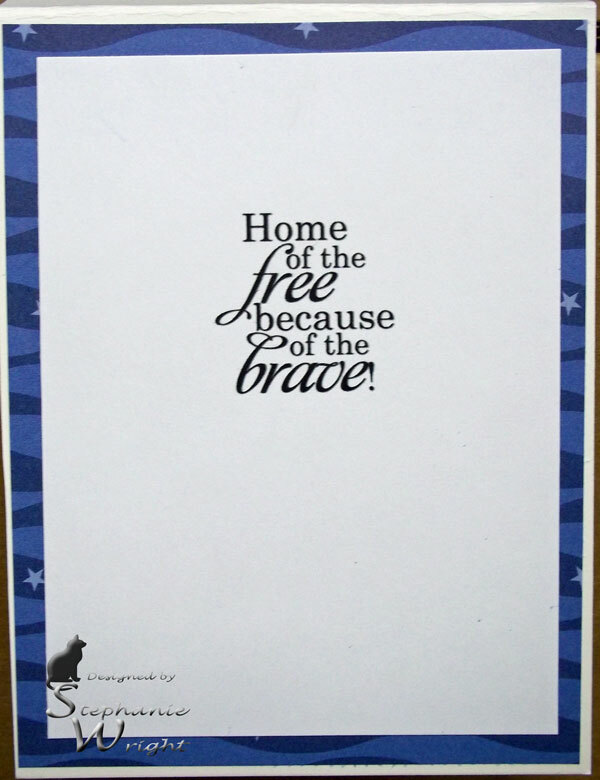 I used one of the sentiments in the Because of the Brave set for the inside of the card. 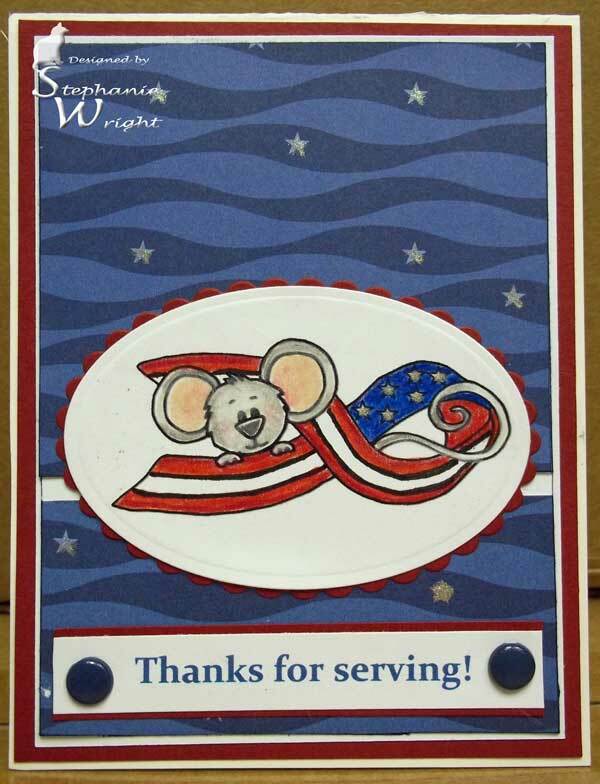 I used sketch #224 at CPS for my card design.